Prescription drugs have revolutionized how we treat disease, which over the last few decades have come to be seen as a panacea for maladies ranging from dry skin to hypertension. As physicians continue to see the benefit of such drugs, their pens can’t write out a prescription fast enough in hopes of relieving their patient’s symptoms. While prescription drugs have been a literal life-saver in some instances, as more patients are prescribed multiple medications, complications and misuse are more likely to happen. Older adults are at risk to misuse prescription drugs since they often are prescribed multiple types of drugs for various issues, leading to adverse drug interactions. According to the National Council on Aging, the risk of experiencing an adverse drug event is 13% for those taking two or more medications and jumps to 82% for those taking seven or more. It is reported that 18-41% of older adults have been affected by medication misuse and taking drugs that effect the central nervous system, such as anti-depressants and pain relievers, are most likely to be abused and misused. Though older adults are at an increased risk of abusing prescription meds, oftentimes complications arise because of misuse by the patient or prescribing physician. Patients can misuse prescription meds by taking a higher-dose level than prescribed, use for purposes other than what was prescribed for, taking with alcohol and skipping or hoarding doses. On the other end of the spectrum, physicians can lead their patients to misuse meds by prescribing an unnecessary high dose and failing to monitor or fully explain appropriate use of the drug. The effects of prescription meds are often heightened in older adults as their livers lose the ability to metabolize so they often require a smaller dose to achieve the same desired therapeutic effect than someone younger. Help them manage their medications with Medication Management Tools that will help them understand the effects and use of their specific meds. Explain to them that taking medications while alcohol is in their system can intensify and prolong the effect of the medication and eventually lead to liver damage. Make sure they know how to read drug prescription labels and to always ask their pharmacist for help if needed. Consumer Reports Prescription Label Decoder offers a comparison of pharmacy prescription bottles and their ease of use. Check out AARP’s Drug Interaction Checker, to understand how certain drugs interact with one another. If you suspect your loved one may be misusing prescription meds, contact their primary care physician for screening and review of their current meds. The common signs of medication misuse and abuse can include falls, changes in speech, confusion, insomnia and drug-seeking behavior such as doctor shopping. If you find left-over medication, make sure you know proper disposal methods. Contact city or county government household trash and recycling services to find medication take-back programs in their area or talk to their pharmacist who may also know of disposal services. September 29, 2012 is National Prescription Drug Take-Back Day, a national initiative for people to safely dispose of their unused medications. Some medications may require the recipient to dispose of the medication by flushing it down the sink or toilet due to its toxicity. Prescription medications can greatly increase the quality of life for your loved one as long as they are used properly. Being knowledgeable about medications and the interactions that can occur can greatly lower the likelihood of abuse and misuse. “Aging & Health A to Z.” Causes & Symptoms Drug And Substance Abuse Aging & Health A To Z Health in Aging. Health In Aging, 01 Mar. 2012. Web. 27 July 2012. 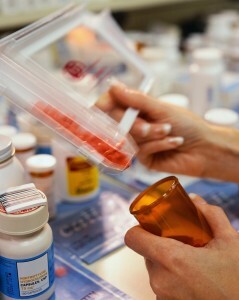 <http://www.healthinaging.org/aging-and-health-a-to-z/topic:drug-and-substance-abuse/info:causes-and-symptoms/>. “Disposal of Unused Medicines: What You Should Know.” Information for Consumers (Drugs). U.S. Food and Drug Administration, 17 July 2012. Web. 27 July 2012. <http://www.fda.gov/drugs/resourcesforyou/consumers/buyingusingmedicinesafely/ensuringsafeuseofmedicine/safedisposalofmedicines/ucm186187.htm>. “DRUG INTERACTION CHECKER.” AARP. N.p., n.d. Web. 27 July 2012. <http://healthtools.aarp.org/drug-interactions>. “Prescription Medication Misuse and Abuse.” Prescription Medication Misuse and Abuse. National Council on Aging, 12 Dec. 2011. Web. 27 July 2012. <http://www.ncoa.org/improve-health/center-for-healthy-aging/content-library/prescription-medication.html>.